ISIS “inspiring” a refugee to carry out a terrorist attack would be the ultimate way to polarise German society. This is what German academic Peter Neumann warned in an interview with Monocle magazine last week, explaining that ISIS leaders “want to help extreme right-wing forces to come to power”. He argued that doing so would fuel division between Germans proud of the Wilkommenskultur displayed as 1 million refugees arrived in Germany last year and those who wish to close borders and turn away migrants. Although we are yet to find out who was responsible for Monday night’s horrific attack on the Breitscheidplatz Christmas market in Berlin, some German politicians are already giving ISIS exactly what it wants. The Bavarian CSU party has used the tragic events to reignite support for its proposed tightening of immigration policy. Meanwhile the far-right Alternative für Deutschland has blamed Angela Merkel personally for the attack. Today I write to you not only as an editor at fairplanet, but as a team member at Give Something Back to Berlin (GSBTB), a volunteer organisation working with migrants of all kinds in the German capital. At GSBTB we run projects that aim to welcome and include our city’s newcomers. One of our weekly projects supports women and children living at the refugee shelter in the disused Tempelhof airport. On Tuesday morning you may have woken up to the news that police had detained a Pakistani man, a possible refugee, suspected of carrying out the Christmas market attack. But at GSBTB we woke up to the news that the vulnerable people who we work to support had had their home stormed by 250 armed police in the middle of the night, searching for evidence, accomplices, anything relating to the attack. At Tempelhof airport hundreds of people sleep in each hangar. Or, more accurately, they try to sleep: the noise of so many people is often unbearable and some have taken to sleeping during the day when there are fewer comings and goings. Having escaped trauma in their home countries, these people now face new kinds of distressing circumstances: the challenges of being housed en masse, with no timeframe for relocation and poor – some have said inhumane – living conditions. On Monday night these residents had a violent storming of their new home added to the trauma of violence experienced in their home countries. The next morning one of my teammates received a Whatasapp message from a child living at the camp. „Komm bitte heute. Ich bin nicht terrorist. Wir sind gut.“ (“Please come today. I’m not a terrorist. We are good”). No child should have to feel the need to justify themselves this way. The suspect said to have been living at the Tempelhof refugee shelter has since been released, and the authorities should be applauded for releasing him without delay. It would have been easy to hold him in an attempt to show a job well done when they have clearly failed, at least so far, to apprehend the perpetrators. Unfortunately, though, in this post-truth era it’s often the news you read first that casts the longest shadow. This is especially true when the information fits an existing narrative, like the one anti-immigrant politicians have long been crafting against refugees. The refugees living at Tempelhof airport – in fact refugees all over Germany and Europe – live with the tag of terrorist, whether they fit the description or not. Refugees like the darling women and children who my teammates play with, do knitting with, cook delicious intercultural feasts with, and work to support. These people are so worthy of our compassion and trust. While we wait to see who might be responsible for Monday’s attack, it’s easy to feel helpless knowing there’s someone out there who wants to see us hurting. #prayforBerlin hashtags feel inadequate – and Berlin’s hipsters are much too cool for them, anyhow – but I know of something tangible you can do to show your support for Berlin and its most vulnerable residents in this time of uncertainty. My request is an unorthodox one, but I hope you will see how this action can bring hope to people who struggle to find it in their current circumstances. Weeks ago – long before this horrific attack became a tragic reality – Give Something Back to Berlin launched a Christmas crowdfunding campaign for the work we do with women and children at the Tempelhof shelter. 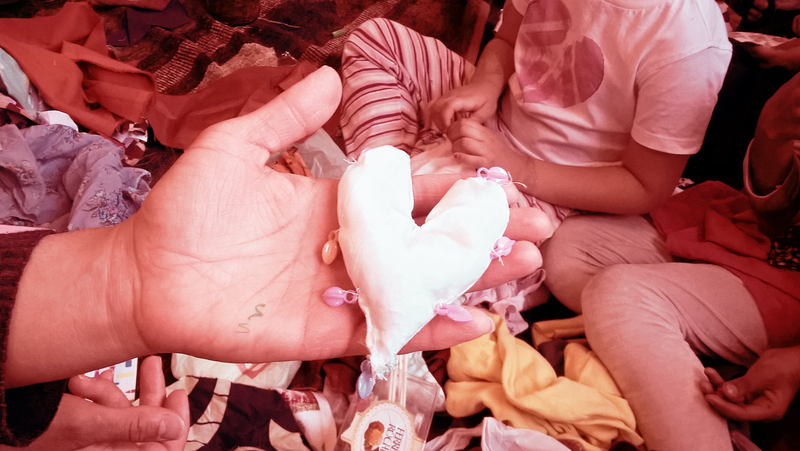 We’re currently halfway to our goal which would see us continue to bring hope, purposeful activity and trauma healing to the 100-150 women and children we support at Tempelhof every week. You can read more about our project and donate on our Betterplace page. As long as we choose not to give in to fear, there is still plenty to be hopeful for this Christmas. Afghanistan: Back to square one! Why are deaths increasing in the Mediterranean?